If you haven't checked it out yet, the amazing folks over at Daytrotter released my second session! I play 3 new songs, that you may or may not have heard live, and a cover of one of my favorite songs about Iowa by one of my favorite Iowans, "Black Iowa Dirt" by William Elliott Whitmore. Check it out at the link in the title. Check out this video I did with the good folks over at AfterhoursSessions.com! Suitcase Randy Davis on the dobro! Today is a good day. It is the first day of Mission Creek Festival in Iowa City (my favorite week of the year) and I have the great pleasure of announcing that I will be playing at Sunset & Shine at the Short Mountain Distillery in Woodbury, TN! This one-day festival has an incredible lineup of Nashville musicians, including Robert Ellis, Caitlin Rose, Rayland Baxter, and more. Make sure you get tickets now at a discounted price. I promise it will be one of your favorite weekends of the year. Much love! I am off to a week full of amazing readings and shows! I am very excited to be playing Mission Creek Festival again this year (5th year in a row!). Please make sure that if you are in the Iowa City area you come and check out as much awesome stuff as possible! I will be playing Saturday, April 5th at Yacht Club with Fruition. Also, just because I like you guys so much, on Monday, March 31st, before the festival starts, I will be doing a short set at The Mill's Open Mic Night for old times sake! Haven't played open mic there in probably 5 or 6 years so I am pumped to just go play some fun stuff. I go on at 11 that Monday. See you soon! I am very excited to announce that my recording of "Because I Bloody Well Stammer" from my Daytrotter Session has been added to Daytrotter's Top Songs of 2013 list! This is a great honor and I couldn't be more excited to share it with you! Welp, I went on tour. I apologize for not keeping you updated on the tour as much as I'd hoped. It was a hectic couple of months and I had an amazing time, met some amazing people, heard some great tunes, caught up with some old friends, and played a little as well. I was able to visit 22 national parks before the governement shut down and documented the entire trip on my Instagram page (@conwaytwittymang). Check out some of the photos, I'm pretty psyched on how they turned out. Anyway, I am back in Nashville and wanted to give a HUGE thank you to everyone who housed me, came to any of the shows, bought anything, gave me a high five, smiled, or any of the other numerous ways folks made the tour better. I can't wait to get on the road again and play! Speaking of, I have three upcoming shows in Nashville. November 20th I will be at Dino's in East Nashville with Alexis Stevens and Nick Woods, so that will be cool n stuff. December 6th I will be playing an early show at The Basement with new tour friend Dennis John Glanville from Madison, WI as well as Miss Alexis Stevens again. And on January 2nd, I will be playing another early show at The Basement with, guess who, Alexis Stevens and our old friends The Lonelyhearts who will be back in town from Iowa City/Ft. Collins. I'll see you out there! First, let me say that I am so grateful to everyone who has purchased or downloaded the new record, to anyone who has helped me set up a show over the past few months as I plan this massive tour, to the good friends who are lending me a place to crash or their equipment (be it camping or musical equipment, any kind of equipment) and to everyone who is planning on coming to a show, or who has already come to a show. These next few months are shaping up to be the trip of a lifetime, and I am so excited that it is underway. The first day of this massive trip was somewhat intimidating. I woke up very early with little sleep to say goodbye to Haley, with every intention of falling back asleep, but alas, it did not happen. I spent the morning double checking everything I had packed, running to Corner Music to see if I could find anything worth picking up for the trip, and generally just being too excited to focus on much of anything. I had so little focus, in fact, that I forgot to bring any toiletries of any kind. I finally got everything in the truck, bid adieu to Batman, and hit the road. People also used to believe that the caves had special healing powers, to the point where a hospital was set up in the Mammoth Cave to treat patients with tuburculosis. Patients would spend years in the cave and almost never recover, in the process losing pigment in their skin and color in their eyes, as well as their minds. Pretty creepy, but awesome. The Frozen Niagra tour takes you through another part of the cave that was discovered by an entrepreneur who decided he wanted to find an opening to the cave that was closer to the highway than the traditional historic entrance. So he got some of his cousins and a few sticks of dynomite and blasted straight through the limestone and found a whole previously undiscovered portion of the cave. 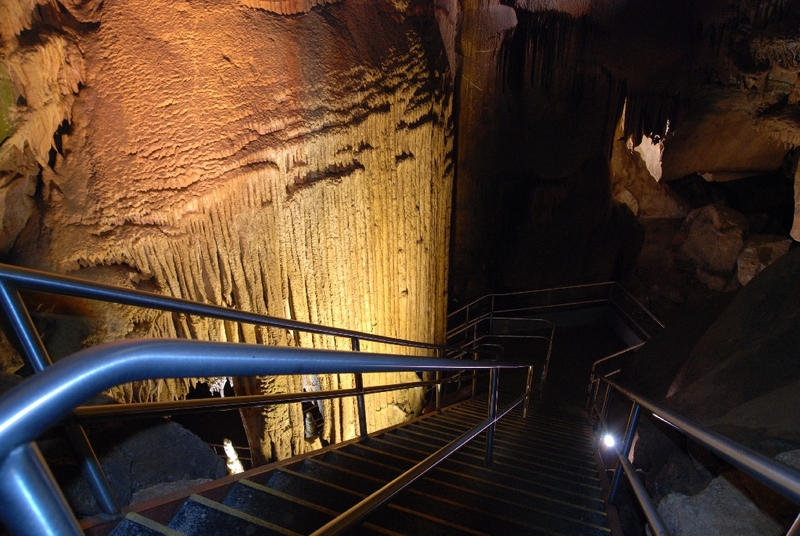 This portion has some of the more typical cave attractions like stalagtites and stalagmites, including one beautiful formation called Frozen Niagra. I would highly suggest these tours to anyone passing through central Kentucky. You get to experience complete and total darkness! After passing through Mammoth Cave, I hopped back on 65 through one of my favorite towns in the country: Cave City, Kentucky. Cheesy and touristy, this town has everything you could want from the Kentucky Action Park, to Dinosaur World, to the Mammoth Cave Wildlife Museum, which is just a building filled with hundreds of taxidermied from around the world. Kentucky at its finest! I drove up I-65 a bit longer before detouring once again to check out Abraham Lincoln's Birthplace. The grounds were pretty cool and featured a handful of old log cabins from the period of Lincoln's birth as well as a nice little hiking trail. I didn't stay very long, but I did pick up a book of Lincoln's quotes, quips and speeches. I expect them to pop up a few times in the coming months. I spent the rest of the day flopping around northern Kentucky, riding the Bluegrass Parkway for a while, getting lost on some backroads only to wind up on the Bourbon Trail passing the Jim Beam Distillery. I took in the rich smell of the unfinished whiskey that flooded the truck and followed several meandering roads that dipped in and out of the hollows and hills. I enjoyed the scenery as much as I could, knowing I will not be back to the south until October. The weather was perfect and the roads were smooth. When I arrived in Louisville, I took a walk down to the beautiful waterfront park, at the suggestion of my old friend Michael "Chiggen Legs" Parkinson (formerly of Oceans and Orchestrated Follies [lol]). After relaxing at the park for a minute, I headed to Haymarket Whiskey Bar for my first show of the tour. The whole ordeal was a bit confusing, as there was a back part of the venue that was hosting a rock and roll show and then a PA up front, where I was to play, that was separate. The whole gig was super laid back, if ill-attended, and I had a great time. I hung out with the awesome St. Louis rockers Blackwater '64 and Louisville punk band Nowhere Fast's Seth Robinson, who played an acoustic set. I had a great time all in all, tried some fantastic bourbon (my favorite was the Four Roses Single Barrel), and got a good night's rest. Day two started relatively early, with me once again trying to avoid the Interstate and get onto the state highways and byways. I took an alternate route to Indianapolis that passed through Bloomington, IN, which I had heard for years was a beautiful part of Indiana, most recently by my friend John Lindenbaum (of The Lonelyhearts and Nadalands). I was not disappointed. The scenery is beautiful as the south bleeds into the midwest, as rolling hills turn to farmland, and as the forrest becomes less wiry and more bold in its demeanor. I rolled through the Morgan-Monroe State Forest and was pleasantly surprised by the winding roads and wooded scenery. I finally got to Chicago and picked up my good friend Keith Campbell who I will be playing 5 shows with on this tour. We gutted out the traffic and jet out to Chesterton, Indiana, which is an awesome little town with a great population of music listeners. We played at The Sound Cellar, an all ages venue, with Indianapolis singer-songwriter Mike Reeb, local band Sweet People, and Chicago scene hero Dave Davidson of Maps & Atlases. The music and crowd were both superb, Keith and I killed some time before the show wandering a boardwalk maze that followed a small creek behind the venue. We decided it would be the perfect place to high school kids to have parties and scatter when discovered by the cops. After the show, we said our goodbyes and hit the local T-Bell for some late-nite grub. I have mixed emotions about the experience and I think Keith said it best: "Eating Taco Bell is like hooking up with an ex-girlfriend; you remember why it was awesome, but you feel real bad afterwards." I am about to pick up Keith once again and head down to Champaign for the evening to play at Mike N' Molly's. I look forward to coming to a town near you! Thanks for reading! Alabama - Livin' Lovin' Rockin' Rollin"
Hey guys! My Daytrotter session went up today! Check it out and make sure you become a member of their wonderful site. They do great and important things for the music community. Big thanks to Sean, Mike, and everyone over at Daytrotter for having me out. I am SO EXCITED to have finished my 10"!!! Recorded and mixed at Flat Black Studios in Iowa City by the one and only Luke Tweedy, I could not be more proud of this one. Huge thanks to my always awesome players Sean McGivern, "Suitcase" Randy Davis, Elle Black, Setu Vora, and the mystical voice of Miss Alexis Stevens. Go on over to the "Sounds" page and give it a listen. A vinyl 10" as well as a CD version of the album will be available in August, but I wanted to share it with you! For a limited time, the record will be available for FREE DOWNLOAD on my bandcamp site, so make sure you go pick that up! Also wanted to say thanks to the great state of Iowa for a fantastic weekend. Seldom Seen was so rad and the dudes over at Daytrotter couldn't have been cooler. Look out for the Daytrotter session in early August!